Leaders and managers are incredibly important—they make a huge difference in both positive and negative directions when it comes to the performance and happiness of staff, activists, and volunteers. If we want people to stick around in this movement, we need our managers to be great. One quick note before we start. Like many of the articles on AMP, this topic was inspired by conversations I’ve had with others in the movement, as well as things I’ve seen and my own personal experiences. The need for good management isn’t confined to large nonprofits, either—these exact same lessons could have also applied to the grassroots work I was a part of. Chances are, if you’re active in the movement, you’re personally familiar with the difference that an amazing (or terrible) manager can make. I hope this article helps us increase the number of amazing managers, and maybe at least bump up the terrible ones to be “satisfactory”. After all, we’re not mindlessly building irrelevant widgets here. We’re doing work that has an impact for animals. Manager: Someone who directly oversees or guides the work of someone else. Leader: Someone who guides the vision and work of many different people, directly or indirectly. These are messy, overlapping definitions—very much like the actual roles of management and leadership. But the crucial difference that we’ll consider for this article is that managers directly oversee or guide the work of someone else, while leaders can influence people at many points in an organizational structure and may or may not directly oversee someone else’s work. This article is primarily about managers. I’ll try not to mix terminology too much, but these lessons probably apply to both managers and leaders in their distinct roles. It doesn’t matter if you work at a nonprofit organization in the movement, or if you work at a for-profit, or if you’re a grassroots activist, or if you’re a volunteer. There are managers in all of these realms, even if they aren’t called that. And, management research can help you learn about working with people to accomplish things, even if you aren’t currently a manager (or being managed). In nonprofits or for-profits, managers are usually just called managers—or supervisors, or bosses, or superiors (which is a gross term to be avoided). In a grassroots group, maybe you’ll have “point people”, or group leaders, or team leads, or something of that nature. In a volunteer setting, you might have a volunteer manager, or a city leader or regional leader, or leaders of small working groups. The main characteristic we’re looking at here is, “Is there someone who is helping to oversee and coordinate the work of others?” If the answer if “yes”, then that person is effectively a manager. And, unless you work completely by yourself and never interact with anyone, you’re either a manager of others or managed by someone (even if it’s only in small ways)—or some combination of the two. There might be some exceptions here, such as groups that operate more-or-less by consensus. But even in these cases—and even in the case of a group of friends casually working on something together—there are always some power dynamics around who is actually coordinating the work and pushing things forward, and how they’re doing that. Even if the role of “manager” is constantly shifting between people, that role and power dynamic still exists within certain people for periods of time. On the flip side, many cases of management are very clear cut. I don’t know everything. You don’t know everything. 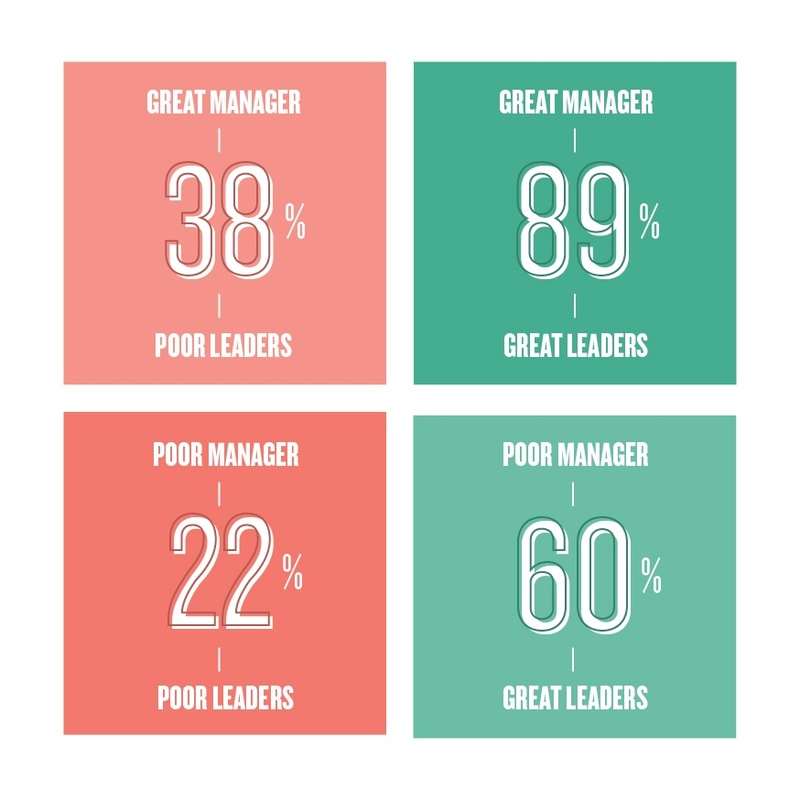 And as the research shows, most managers have a lot of room for improvement. You also probably know some managers. If they aren’t helping their people succeed, those people are going to leave the organization, the group, or the movement; and then less work is going to be done for animals, and we’re going to take one small step back from our goal of ending animal exploitation. This is a topic that matters in very real, tangible ways. Ever heard the expression, “People don’t leave companies, they leave managers”? Let’s look at some data to see how true that is. 50% of people have left a job specifically because of their manager—maybe that quote about people leaving managers has some truth in it. How engaged a manager is directly affects the engagement of their staff, too. 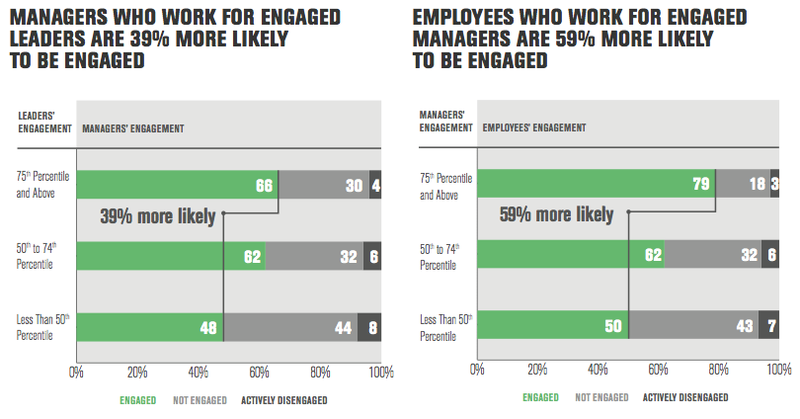 Gallup found that “employees who work for engaged managers are 59% more likely to be engaged.” Engaged managers lead to engaged employees, and vice versa. Gallup defines a manager as “someone who is responsible for leading a team toward common objectives. This individual takes the direction set forth by the organization’s leadership and makes it actionable at the local level.” They define a leader as an “executive” in an organization, which I believe in their case refers to leadership high up in the organizational hierarchy—not to be confused with Peter Drucker’s definition of “executive”, which is a knowledge worker with decision-making authority. What Management Qualities are Correlated with Employee Engagement? Consistent communication between managers and employees was also correlated with higher employee engagement. The highest engagement occurred with staff who had some form of daily communication with their managers. Whether they believe they are likely to still be with their company in two years’ time. 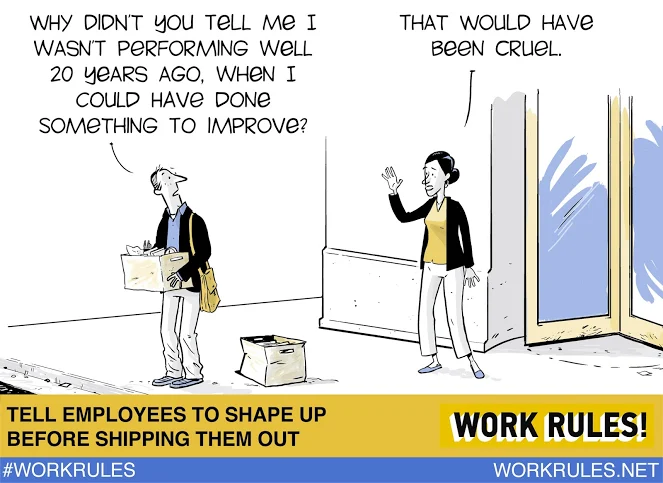 Source: Culture Amp—What matters most when it comes to driving employee retention? The data appears to show that managers actually don’t have that much of an impact on whether or not people stay at companies, relative to other factors—but there’s at least one good reason why I think we should question that conclusion. The primary reason I think we should be skeptical of using this data to infer that managers matter less is because many of the other categories in this survey are often very much affected by someone’s manager. For example, the top three feedback categories correlated with someone’s intent to stay are Alignment, Leadership, and Learning & Development, which could all be greatly affected by good (or bad) management. A person’s manager is often their first line of support for helping to craft alignment with their work, and to suggest a move to another role or department if the person is really struggling. Similarly, a manager can be instrumental in guiding the learning and development of an employee by providing challenging assignments with ample support, giving constructive feedback, and providing resources for learning. And, although someone’s manager can’t necessarily impact the leadership of an organization, great managers are sometimes able to provide stable microclimates of good culture and strategy within their teams even if the rest of the organization isn’t running as smoothly. To have the best results (which in this case is measured by staff retention), you must pair great management with great leadership. So Then—What Is Great Management? Now that we’ve talked a little bit about how important management is and how much it can affect your staff, let’s look at the qualities of great management. Because the people who work with you depend on it, and the animals depend on all of us. Researchers at Google actually set out to prove that managers didn’t matter to the performance of teams. (Anarchy!) As Google stated about this research, “This hypothesis was based on an early belief held by some of Google’s leaders and engineers that managers are, at best, a necessary evil, and at worst, a layer of bureaucracy.” But after conducting the study and analyzing the data, alas—they found that managers did actually matter, on both quantitative and qualitative measures. The original research was conducted in 2008, but an update posted in 2018 revealed that the same basic findings held true over the course of a decade when they reran the study. (A couple of the items did get updated, and items 9 and 10 were added.) 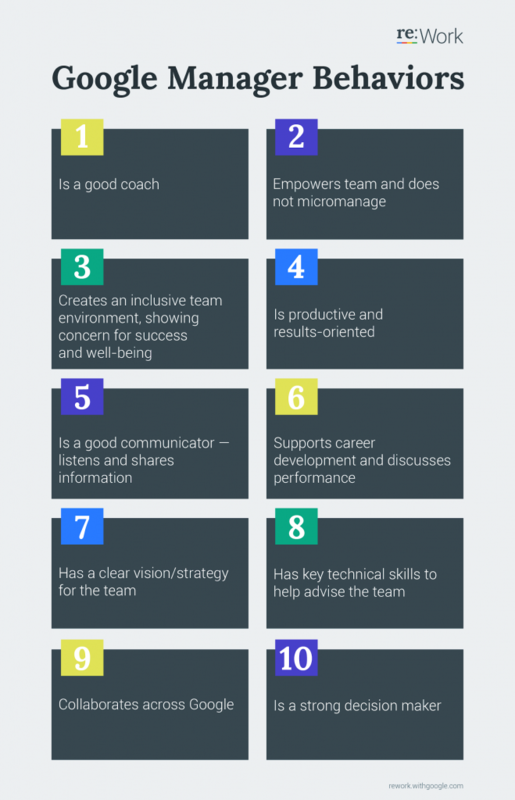 These ten manager qualities were predictive of low turnover, high satisfaction, and high performance on teams. Google also approached this question from a different angle in Project Aristotle and asked, “What makes great teams?” They thought that qualities like team size and composition would be the biggest predictors of success, but this isn’t what came out of the research. They found that team dynamics actually played a bigger role than team composition. In fact, they found that the number one characteristic of a team that positively correlated with that team’s success was psychological safety. Of course, this is where managers come into the picture. Managers have a huge impact on whether or not people feel psychologically safe: Behaviors like inviting people’s ideas and comments increase the psychological safety, while behaviors like belittling people or ignoring introverted people lead to low levels of psychological safety. Team members show they are sensitive to how one another feels. Here’s the full list of suggestions that Google put together for how managers can foster psychological safety in their teams: [re:Work] Manager Actions for Psychological Safety. Next, we turn to a concept from the book Good to Great by Jim Collins. When Jim Collins set out to find what makes some companies go from average performance to sustained excellent performance, he specifically told his team to not fixate on leadership. Too many people give all the credit to the person at the top, he said, when there are tons of other factors that really play into it. But leadership ended up making its way into the book anyway, in a concept called Level 5 Leadership—the data was too convincing for him and his team. Even when Jim tried to get away from it, it came back: Leadership really is important. Both of these attributes can find their analogues in the list of ten characteristics that Google identified as being qualities of great managers. Level 5 Leaders also embody something that Jim called the window and the mirror: They looked “out the window” at everyone around them to allocate successes, but they looked “in the mirror” at themselves when things went wrong. They shared credit and took blame. If you can leave your ego at the door and focus entirely on making your team and your mission successful, and if you can share credit for success and take responsibility for blame, then you’re taking on the qualities of Level 5 Leadership. So you can challenge people directly, and you can care about them personally—or only one of the two, or neither. But when you challenge someone directly and you care about them personally, that’s what Scott calls “radical candor”, and that’s how you empower others on your team. Scott mentions that this combination of caring personally and challenging directly is particularly hard to accomplish given many aspects of our culture, such as the notion that “professionalism” in the workplace requires blunt feedback without caring, or the idea we were taught growing up that “if you can’t say anything nice, you shouldn’t say anything at all”. It’s useful to think about which quadrant you might find yourself in most of the time. Personally, I do find myself drifting into the other three non-desirable quadrants based on my mood or the context, and I most often slip into the “ruinous empathy” category. I’m fairly conflict-averse, and I enjoy encouraging people, so it can be hard to challenge someone directly in a way that might be uncomfortable, introduce negative emotions, or cause them to doubt their ideas or their work. But that’s why this concept is so important, because of how tricky it can be to be “on” for both of these axes. A great example of Ruinous Empathy from Laszlo Bock. 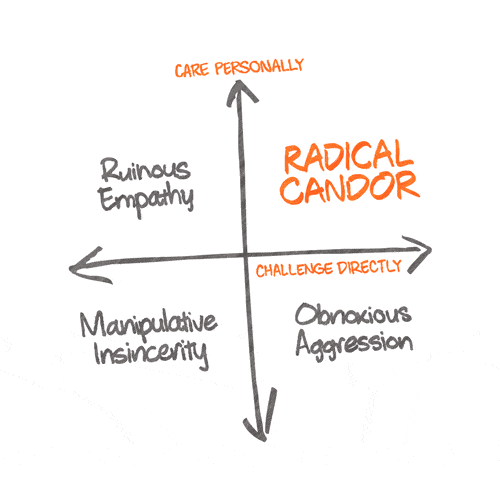 The concept of radical candor actually relates quite a bit to what Angela Duckworth describes in her book Grit—especially the section about “parenting for grit”, where she mentions that a combination of being both supportive and demanding is a good formula to help create gritty kids who are more successful. This concept has especially hit home for me recently, and even practicing this mindset for a few weeks has helped me feel more positive and (I think) be more productive. But of course that’s just a small anecdote. Let’s start by asking the question: What makes knowledge workers feel positive and motivated about their work? Making progress, even minor progress, leads to greater motivation and good feelings. That motivation and those positive feelings, in turn, lead to more progress. It’s a beneficially self-reinforcing cycle. But, there is a warning here as well—the researchers found that small setbacks can also have a disproportionate effect on motivation and emotions. The solution? Help your staff make daily progress, even if it’s small, and try to help them avoid or reframe setbacks. The research above is a great place to start, but if you have the time and resources you could consider running your own internal survey to find out what qualities make great managers in your organization or group. Every situation is different, and you can only learn the nuances by running some experiments yourself. In their guide on what makes great managers, Google provides some tips for getting started with your own internal research: Determine what makes a great manager. Management is extremely important at all groups and organizations, no matter what you call it. We know some of the pieces of great management, like fostering psychological safety and being a good coach. These pieces can be learned, and they can make a huge difference for your team’s happiness and productivity. Assess your own expertise as a manager, and ask others for their candid feedback—especially your staff. Work to improve your management skills, one piece at a time. Share this with other managers who you know in the movement. And if a few people increase their abilities as managers, and those teams increase their impact for animals because of it, then that’s good enough for me.